Checking dimensions for new meter face! Panel meter face plates have always been a problem for me in my home brew projects. Either the face plate was not of the correct scale, or it needed some changing. In the past I have used dry transfer labels to add markings. In some cases I used a pencil eraser to lightly remove markings before dry transfer application. The results were usually functional, but lacked the professional look I wanted to get. I wanted easily customized meter faces that looked great and could be made at home for low cost. I never found it. I continued to use my old methods until I discovered how Jim Tonne, W4ENE, makes his. W4ENE has developed a meter scale program that makes the design of nearly any panel meter easy. I discovered both Jim and his software through a mutual friend. Not many people were aware of what Jim's software would do when my original QST article appeared in October 2002. Everyone that I talked to loved his program and was enthusiastic about the possibilities. Since that time, Jim has made significant improvements to his original program and the information in that original magazine article is now outdated. 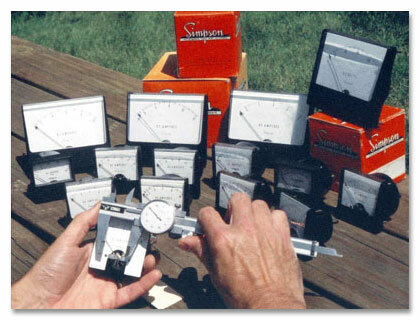 The photo below is one Jim took illustrating a typical meter scale made with his meter software. His website covers all of the details, and you can download the software from there. His website includes other significant software tools that you may find necessary for your toolbox, particularly if you do filter design work. I call his technical software offerings Tools that Matter.